Bosch is creating a mapping system for automated driving using radar signals originally developed for driver assistance functions. 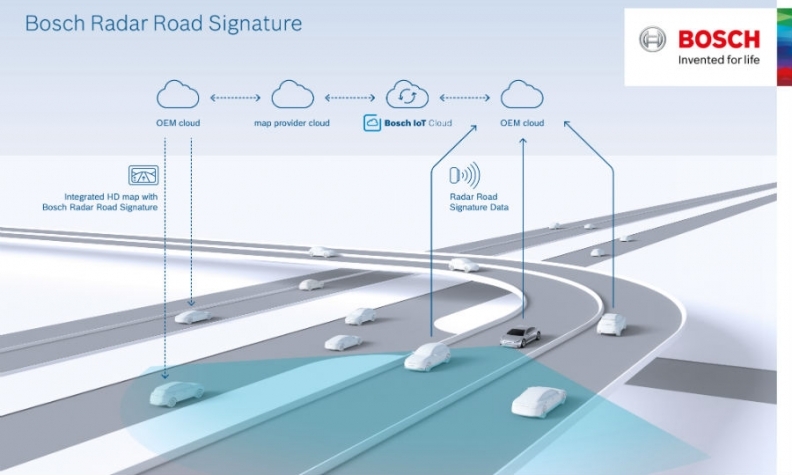 German supplier Robert Bosch and mapmaker TomTom are developing a high-resolution mapping system using the supplier's radar sensors. The technology is intended for use in self-driving cars, helping vehicles determine their location within centimeters, Bosch said Wednesday. Road data will be collected via the radar sensors in real time, which the supplier said allows for greater range and detail than camera sensors. TomTom will integrate this data into its mapping system. "Cars arriving on the market in years to come with the assistance functions of tomorrow will be running the map for the automated vehicles of the future," Bosch board member Dirk Hoheisel said in a statement. Bosch said it will begin collecting data by 2020. The supplier said it will need separate fleets of 1 million vehicles collecting information via radar sensors in North America, Europe and Asia Pacific to ensure mapping accuracy. Bosch's radar sensors, originally developed for driver assistance functions, can detect moving objects up to about 250 meters (270 yards) away, compared with the 150-meter capability of camera sensors. The supplier is adapting these sensors to also detect non-moving objects to create more holistic maps. High-definition mapping has become a growing sector as the industry prepares for the deployment of autonomous vehicles, which will need to be able to accurately pinpoint their surroundings without a driver at the wheel. The key to creating such detailed and up-to-date maps is massive amounts of data that are constantly being collected. Here, a map provider partially owned by Audi, BMW, Daimler and Intel, partnered with camera sensor supplier Mobileye in December to use its sensor data to power intelligent maps. DeepMap, an autonomous-vehicle mapping startup founded by Google Maps veterans James Wu and Mark Wheeler, plans to use data from both camera and lidar sensors on self-driving cars to build its 3D maps in real time.